Panini did not wait long to make the number one pick from the 2011 NBA Draft, Kyrie Irving, a new member of the their team of exclusive players. Irving was selected by the Cleveland Cavaliers with the first pick last night and is expected to be the team's point guard of the future. 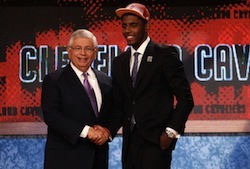 Irving's selection was one of the few things that went as expected in a draft filled with trades and surprising picks. Irving spent one injury-plagued season at Duke but showed enough flashes of brilliance to warrant the first-overall pick. He will be a central figure in the process of rebuilding the Cavaliers after LeBron James left the team last season to pursue a championship with the Miami Heat. Irving joins the second pick of the draft, Derrick Williams, as the faces of the 2011 NBA Draft class for Panini. As part of their exclusive contracts, only Panini products will contain autographs and memorabilia from the two rookies. Like Williams, Irving's first official card will appear in 2011-12 Panini Prestige. Other Panini-exclusive players include Kobe Bryant, Kevin Durant, Blake Griffin and John Wall. Read more about Irving and other top players from the draft in our pre-draft article. Find Part One here and Part Two here. Also, be on the lookout for an upcoming draft recap.